The Smoke Hollow 205 Stainless Steel, Portable Table Top Propane Gas Grill has a 305 square inch cooking area, with 10,000 BTUs. This grill’s compact design has a locking lid, a large carrying handle, and legs that fold up so you can carry it anywhere and setup in seconds. And, with its foldable legs and 21 pounds total weight it is almost as portable as a briefcase, too. It’s really 22 pounds because you must include the one pound can of gas, but still truly portable and easy to setup anywhere you want a quick burger or small BBQ. At 11.25 inches by 18.5 inches, the actual grill size is quite big and gives you 305 square inches of grilling space for hot dogs, burgers, and brats. A small, portable table top grill with a warming rack that uses a one-pound disposable propane gas container. The design is genius. 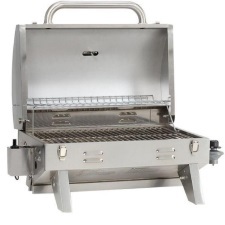 This grill stows away in seconds, the legs fold up nicely and the cover latches down well; however, the grease pan does not lock down and may rattle a bit while walking with the grill. Yet, for such as small portable grill, it can cook eight burgers at a time or a good assortment of hot dogs, brats, and chicken, which is what you need for a tailgate party or picnic. With the Smoke Hollow Table Top Propane Gas Grill, you get a table top grill that is perfect for tailgating, camping, picnics, and just about anywhere you want to set up a gas grill and cook some brats or burgers and create an outdoor party. Whether you’re waiting for the game or it’s a planned event for lunch outside work or at home, you cannot find a more convenient gas grill at this price, period. Less than 80 bucks to create genuine good time, unbelievable. I mean seriously, you could setup this little gas grill on a small boat while you’re fishing and grill freshly caught fish or some burgers and dogs for the fishermen and women. There’s even a warming rack to heat up those buns while you are grilling the meat. You just can’t do that with even the smallest charcoal grill because of the mess and likelihood of setting the boat on fire. The 10,000 BTU output is nearly double what you will get from comparably sized grills, some at double or triple the price. What that will do for you is allow quicker heat up in a shorter time, which in turn saves you time on the grill. We found 1,139 customer reviews by verified Amazon purchasers, with an average rating of 3.8 stars out of a possible 5 stars. Out of the 1,139 customer reviews, nearly three quarters, or 71 percent gave it either 4 or 5 stars. Of the reviewers that gave it three stars or lower, the majority complained that the igniter gave out or did not work, and the left side where the burner curves get hotter than the right side, but for the price, you could always use a portable igniter and use the left side over the “U” for searing if necessary. In summary, this is an excellent bargain for a portable, convenient table top propane grill capable of providing great grill taste quickly and conveniently. The thing to remember here is that it is an $80 portable grill. It is unrealistic to expect the same performance as a $300 grill. Perfect for sports fans that love to tailgate!